She mowed the lawn in high heels! Views from the Edge replies: Seylon, WHAT AN UNEXPECTED TREAT to hear from you. I never know who reads the blog, so to hear from you means a lot. Please say more about the Cuban references. Was she Cuban? Had she spent time in Cuba? Smoked Cuban cigars, drank Cuban rum? At the helm on suitor’s boat on the way to Cuba..
She used to talk about the dolphins that would swim along the sailboat. Her first tattoo the family took her to get was of Dolphins and the word Cuba 🙂 She was 75. She would talk about how she brought a roll of shiny new pennies to give out to the kids there because she knew the country was poor and she thought it would be a cool gift to them. I guess a little boy she had met was not thrilled with the pennies…she used to say he expected more money then her little pennies. But she also loved cigars and used to smoke them. I am in the military and tried getting her cigars made from every place I’ve been…my last trip I got her a while box of Cubans…I told her we could crack the box open once I had my baby. She laughed, she said she didn’t even know if she could smoke one anymore. She mostly collected the boxes…. she collected a lot of stuff… antiques, paintings, everything 🙂 It’s crazy that her obituary got all the way to Minnesota. It’s pretty neat how someone who means so much to you can be a small part of a stranger’s life. Another granddaugher responds: Hi, I am her oldest granddaughter, Summer. My gran would have loved this!! My gran never left her house without looking like a movie star from her big up-do to her fur coats. She went to the top of a mountain on a dirt bike and mowed the yard in heals. Always had a cocktail and ready for some fun. We always had a project to do together from making jewelry, beading necklaces, sorting jewelry or gemstones. We even made picture frames with jewelry. My mom and I took her to get her tattoo. All three of us got one that day. Three generations getting a tattoo coolest thing ever. 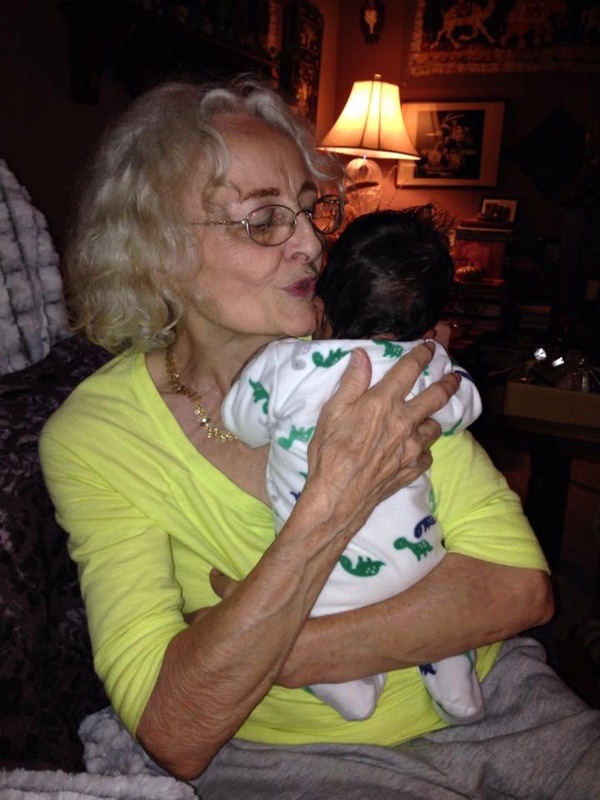 Great grandma singing “Itsy bits spider” to Seylon’s newborn child. She loved her family more than anything else. She wrote notes on everything she ever gave me. She made a tote box for all her grandkids and when I opened mine it has every Christmas card, valentine , letter, picture I drew and my baby clothes. She kept everything I ever gave her my whole life was in this box. She treasured me as much as I did her. 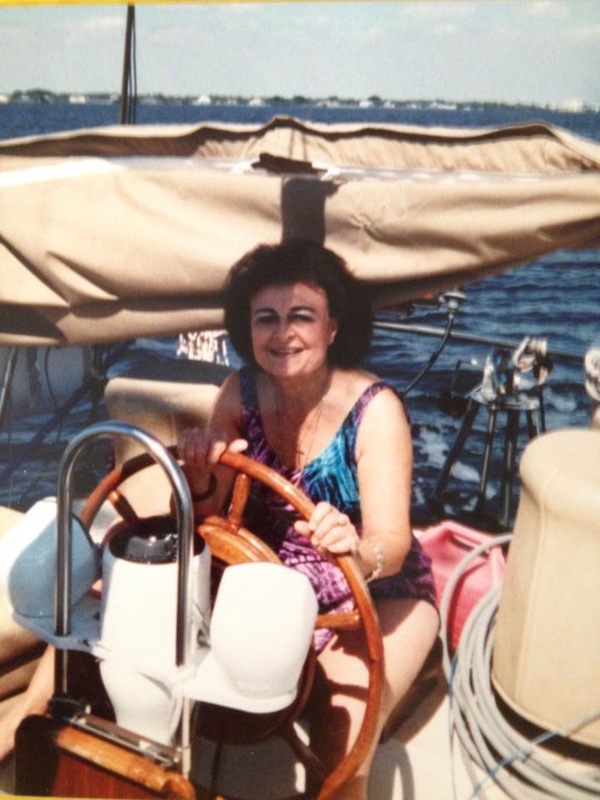 Thank you for taking the time to write about my amazing grandma. Joan’s oldest daughter comments: Hi Gordon. This is Joan’s oldest daughter, Rebecca. My niece, Seylon, called her mother from Germany this afternoon just as my sis and I were sorting thru “the goods.” (There’s a packed house.) I cried as she read your column to us. I’ll have you know that I went all out when writing the obituary because my mother did not want a funeral. She said, “I don’t want a bunch of people strolling by my dead body pretending that they liked me. I know who my friends are.” To be led to your column was an amazing stroke of synchronicity, and I’m sure my mother would think you did right by her. My mother was not Cuban. Her father was a Romanian immigrant who came here as a child. Her mother was from Illinois, and we don’t know much more because the family split up when Joan was young. 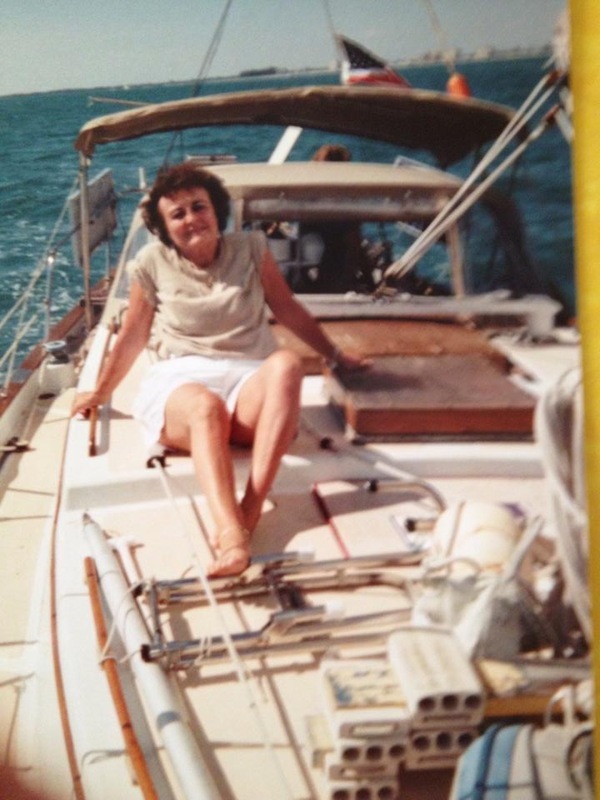 Joan Copeland on suitor’s yacht sailing illegally to Cuba. 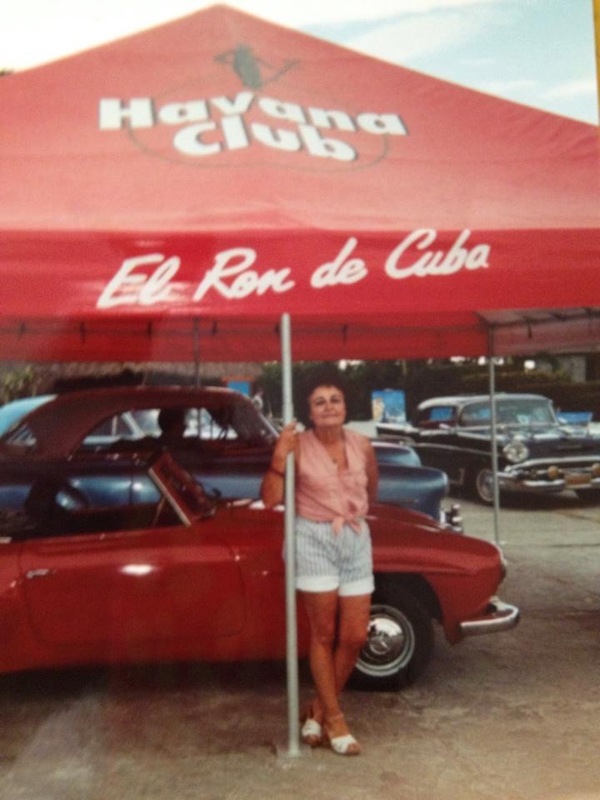 Her sailing trips to Cuba were with one of the prospects she finally told to go away. 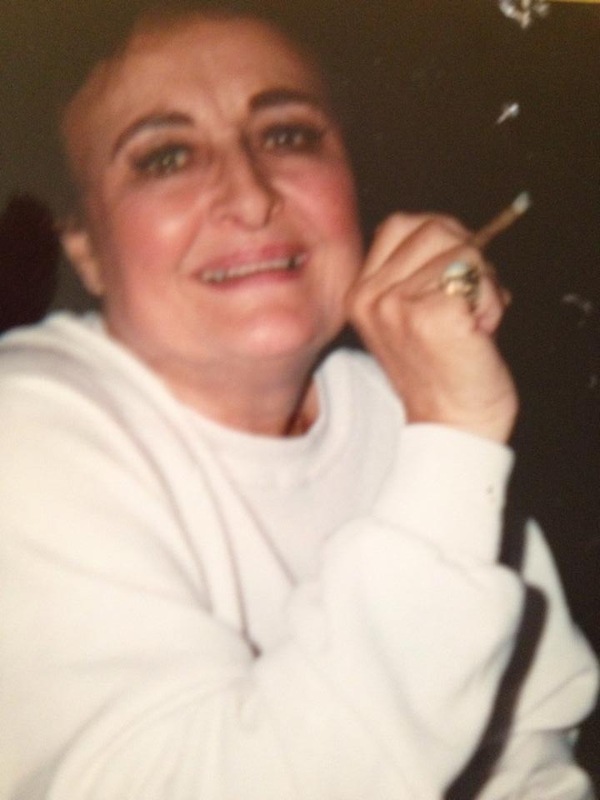 She was in her mid-60’s at the time, and wouldn’t hesitate to smoke a good cigar w/ you. Here’s just one more little tidbit I thought you might like. My mother enjoyed her martinis and for years she collected antique pewter. At my sister’s suggestion, we had her ashes put into a pewter cocktail shaker from her collection. When Seylon gets to come home on leave in July, we will scatter Joan’s ashes over her mother’s grave as per her wishes. – Rebecca. I wish we were all that interesting!